Descending down the Via Garibaldi from the American Academy in Rome, the Museo della Repubblica Romana e della memoria garibaldina and the Mausoleo Ossorio Gianicolense in back of which is the tomb of Goffredo Mameli the poet and adjustant to Garibaldi who died at 21 and composed “Fratelli d’Italia,” you come to the Palazzo Corsini on the Via della Lungara. The palazzo houses the Galleria Nazionale d'Arte Antica and faces the Accademia Nationale Dei Lincei, a government supported institute that fosters the relationship between science and art. 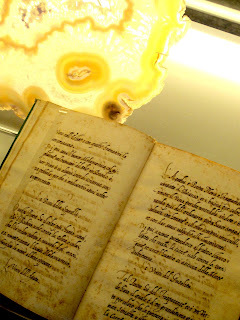 Galileo studied in the Biblioteca of the Accademia, whose ideas infuse the Palazzo and whose Caravaggio, Poussin and Fra Angelico’s now compete with an exhibit on minerals which also includes some exquisite antique texts. “I pigmenti nell’arte come nascono I colori” is an exhibit at the Palazzo which demonstrates the interweaving of science and art. The ghost of Garibaldi hangs over the ancient streets, leading to the Palazzo which is a kind of backwater to European culture filled as it is with lesser known works by artists like Rubens and Caracci. There’s even a painting by the father of Artemesia Gentilesci. The Palazzo is the kind of place where Guiseppe di Lampedusa the Sicilian writer of The Leopard, who died in Rome in l957, and wrote so artistically about the Risorgimento might have found solace.